The sign in front of the Hope House Christian Counseling Center, located at 24 E. Water St., Sinking Spring, is shown in this photograph. The verse is from the book of Jeremiah 29:11. Hope House, opened three years ago by Julie Seaman, is not a residential facility. It is a non-profit counseling center that provides professional counseling in a Christian setting. Fees are based on client household income, which makes the services offered affordable for all who seek it, according to Seaman. Counseling is offered in areas including marriage, children’s, grief, general and addiction. She decided to open the center, Seaman said, as a result of her own journey with depression. She said she wanted a Christian counselor, and that when she sought treatment she had to travel long distances and the services were costly. Most of the center’s clients come from Highland, Adams, Pike and Brown counties, Seaman said, but she added that the center is open to anyone seeking help. Fees at the Hope House are based on income. Seaman said a visit costs anywhere from a minimum of $30 to a maximum of $80. It also offers what Seaman calls a “pay it forward fund.” Through that fund clients sign an agreement for six visits to pay what they can, and “pay it forward” picks up the rest. She said money for the fund comes from individuals who randomly make donations. “Money issues on top of other issues are a double whammy, so we want to help if we can,” Seaman said. One thing that has surprised the staff, Seaman said, is the amount of children that come to Hope House for help. “It’s been bigger than we thought. Coming from a teaching background, that’s special to me, to see them get help early on,” she said. All the counselors at Hope House are professionally certified, according to Seaman, and the center does not accept any grants that put limitations on what it can and cannot offer. The center also does not file insurance claims, but does provides its clients with information they can submit to their insurance company on their own. The center is open Tuesday, Wednesday and Thursday from 8 a.m. to 7 p.m. and Friday from 8 a.m. to 3 p.m. Anyone interested in Hope House services can call 937-588-4488. An intake form is filled out during the initial phone call. Seaman said the following are comments the center has received from its clients. For more information visit hopehouseccc.com. “I think it’s a welcoming, Christian atmosphere where people feel the love of Christ when they walk in, and feel a renewed since of hope when they leave,” Seaman said. 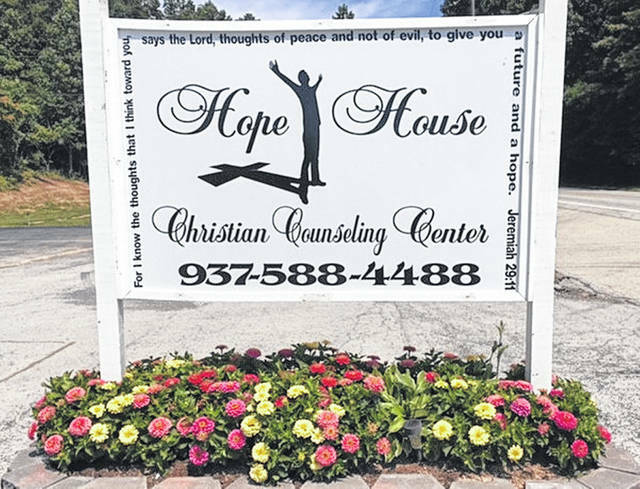 https://www.timesgazette.com/wp-content/uploads/sites/33/2018/08/web1_f-hope-house.jpg.jpgThe sign in front of the Hope House Christian Counseling Center, located at 24 E. Water St., Sinking Spring, is shown in this photograph.